Slipping through the fingers of time, we follow a search for freedom and fulfilment in this visually rich and surreal tale. A collaboration between filmmaker Roswitha Chesher and Average Height Ladies - Sophie Arstall and Elizabeth Barker. A Big Dance & Channel 4 commission. A celebration of space and dance. ​Commissioned by The London Borough of Bexley for the year 2012, The London Olympics in the UK. 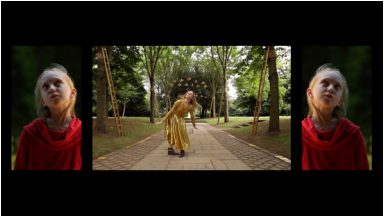 The film was performed by amateur dancers all based in the London Borough of Bexley and filmed on locations in the Borough.